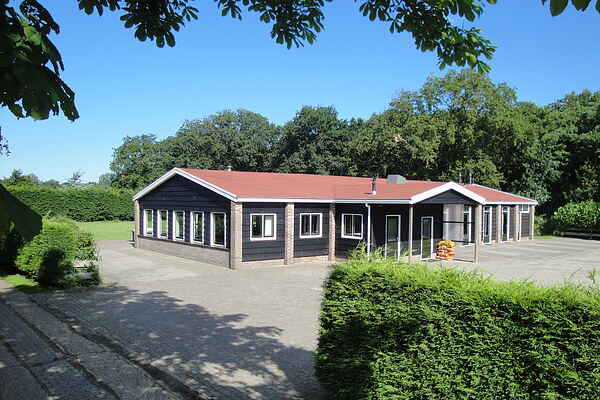 ‘Hoeve Bosrand’ is a large but charming house that can accommodate 48 people. All the rooms are on the ground floor and the interior design is practical and efficient. From the conservatory you have a view of the large private playing field and terrace. The bar and the large wood stove are sure to enhance the fun atmosphere of an evening with your group. There are picnic tables on the terrace at the edge of the forest, which is a wonderful place to sit in the sun. The large private playing field next to the accommodation offers plenty of room for a wide range of sports. The house also has table tennis, a swing, Dutch shuffleboard, table football and hockey sticks with nets. And free WiFi of course. There is parking on site.